We are delighted with the completion of Phase One of a major redevelopment. Led by Harold Blackburn & Associates Ltd. the Northfields Avenue end of the premises has been remodelled to create two meeting rooms, new coffee point and upgraded toilet and cloakroom facilities. The work has clearly enhanced the appearance of the church to the advantage of the local area. 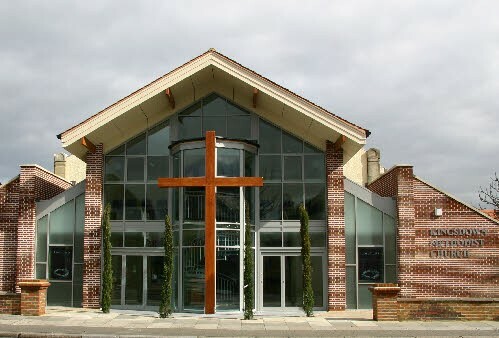 The focal point is a 6m high cross and the changes have dramatically altered the public perception of the church. Turf has been laid at the front with its long term visual and ecological benefit. The seating is giving much pleasure to passers by. Our Redevelopment Group – meets regularly to plan dozens of imaginative and enjoyable events raising the thousands of pounds we need. But our entire church family is encouraged to come forward with ideas.